Purchasing a bulk supply of origami paper is an excellent idea if you plan to create numerous origami projects. Origami paper may be in use for a variety of creative art projects, including note card creation, decoupage, scrapbooking and home decorating projects. For a beginner, it may not be necessary to purchase a large amount of origami paper. A small packet of it is usually available at most craft stores and even in some department store craft sections. 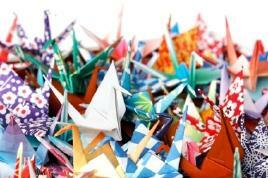 Origami artists who create a number of projects will want to purchase in bulk to save money. Origami paper can be expensive when purchased in small quantities. When it comes to buying origami paper, several things determine the cost of it. Even when purchasing in bulk, consider the importance of these traits. For example, some origami papers are high quality or "fine." This will cost more. Artisan origami paper is the finest quality. This usually handmade paper is imported. Some may feature ancient kimono patterns, which will make them more expensive. Origami paper is also available in numerous sizes. Paper may be as small as two inches. Six-inch origami paper is more commonly in use for origami projects. Larger sizes may be available as well, but they are harder to find. It is worth purchasing origami paper in bulk if it meets your needs. Many distributors do offer kits, which offer various sizes, patterns and types of paper. These kits may be a good thing for beginners who are purchasing their first origami papers. CPG Origami: You can purchase origami paper in bulk from CPG Origami. The company offers a variety of patterns, and bulk packages include anywhere from 100 to 1000 sheets depending on the style you choose. There's a $50 minimum order, and orders of at $100 ship free. Hanko Designs: For school needs, Hanko Designs offers a large assortment of bulk origami paper. Most sets contain numerous paper colors and patterns. You can also purchase premium Washi papers. Blick Art Materials: Visit Blick Art Materials for specialized paper choices. The company carries Aitoh double-sided origami paper and mesh paper. Paper assortments in solid colors are available in bulk packages up to 200 square sheets at a time. The company also offers a large assortment of pattern choices and kirigami paper. Do You Need Origami Paper? A bulk supply of origami paper may not be necessary for those who would like to create just one or two projects. For school art projects or for serious origami artists, having a bulk supply is important. Origami paper is easier to fold due to how thin it is. Construction paper, on the other hand, would not fold properly for intricate projects. Origami paper often features unique patterns. These patterns may be the same ones used for centuries by origami artists. The patterns are not commonly on other types of paper. Artisan origami paper is handmade, fine quality paper designed specifically for the art. This type of paper may be a bit more expensive, but it is easier to fold and produces a better-finished project.